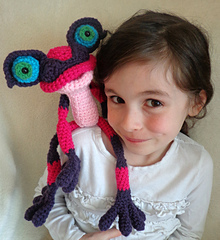 This pattern makes the most adorable froggy friend for little ones. She’s bendy, friendly, and loads of fun! She is 14” long and 6.5” tall when sitting! 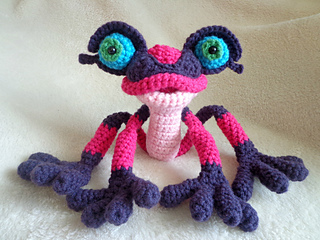 This pattern grants permission to sell the finished frog. This pattern is in English and uses US Standard terms. It has detailed instructions and lots of photos to help you along the way. 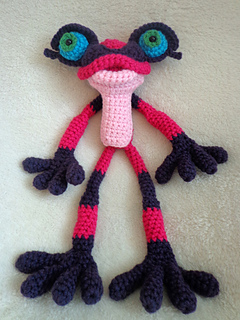 You should be familiar with amigurumi, as there is a lot of hand stitching required. 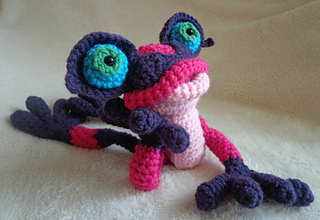 4mm/G Crochet hook, Small amounts of medium worsted weight yarn in the following colors: Dark Purple, Hot Pink, White or Turquoise for the eyes, and Light Green for the Irises; 8mm Safety eyes (or stitch the pupils), Polyfill, Scissors, Stitch Marker. Gauge is not essential to this project, but be sure that your hook size and tension creates a fabric without holes. You can use a 3.75mm, but this may result in a smaller frog.